The heat of summer has settled in this part of the state this past weekend. It is that stifling kind of wet-rag heat that keeps you sweaty even while sitting still. At the moment, my dog lays aspirating in front of the two fans in our living room where it is still bearable without turning on one of our 3 window air conditioners. We tend to wait until it is no longer tolerable before we cave and turn them on, because once they're on, they tend to stay on. Summer is a bit of a mixed blessing in my mind. It is kind of a time of unrest for me. I want to do everything and nothing at the same time. I realize the weather won't last, so I want to fish, swim, bike, walk, camp and kayak all in the same week. At the same time, the heat saps the ambition to do any of it, willing me to stay indoors and avoid the heat. 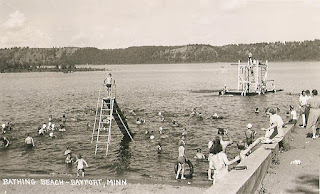 One of the ways we used to beat the heat was to pile our family in Mom's Impala and our step-family in my stepfather's Galaxie 500 convertible and drive to Bayport beach. In looking at the photo above which was from the website, I see that it is nothing like I used to remember it. I remember it more like the photo here. This picture predates my era there (the 70's), but the beach area that I remember is as shown. Notice the highly unsafe double-decker raft in the deep water. It was a raft I never made it to. I was a weak swimmer, terrified of the water and always seen as the family member most likely to die in a drowning accident. I was more like the little guy playing near the slide, while all of my aquatically gifted siblings were diving off the diving board out there "over my head." We used to love when mom and Jack would say we were going to the beach. It meant swimming, fishing, and hot dogs and hamburgers on the grill. After a long nap with my mom on the army blanket, my stepfather would punt and throw the football to my stepbrother. I remember thinking he was such a good punter and why didn't he play professional football. Evidently out-of-shape, forty-something punters are not a hot commodity in the NFL. That didn't preclude him from being a hero in my eyes. Because my mom was a working mother of six children, it meant we were left to amuse ourselves everyday in the summer, with my older brothers and sisters left "in charge" of the rest of us. We rode our bikes to the Mississippi river (4 miles) to catch carp, explore and break up the monotony of the weekdays. We climbed the bluffs by "the monument" and fished the current near the boat landing at Hidden Falls. Our backpacks stuffed with PB&J and our canteens filled with grape Kool Aid. We biked to Como Zoo (3 miles). We skirted the "bad neighborhood" by weaving our way west around the trouble spots, hoping there were no perpetrators looking to harass a bunch of kids on bikes looking to kill their boredom. Como zoo was always free, so we'd lock our bikes, walk the zoo and finish up with a game of mini-golf. Sometimes we'd make a fishing day of it and fish in Como Lake, a man made lake that usually got pretty green by summers end. On occasion we'd drift into the golf course area and look for wayward golf balls. None of us golfed, but we hoped to sell them back to golfers at the clubhouse. Summers were a time for back yard carnivals too. We usually spent three days planning it, two days hyping it in the neighborhood, and it was over in three hours, usually to the profit of about ten bucks, split 3 or 4 ways. Never mind that we probably used twelve dollars of mom's food and paper supplies. That never hit the bottom line. The same went for lemonade/Kool Aid sales on the front walk. We were on an "off" street, so foot traffic was mostly neighbors. When we'd tell mom of our $3.00 profit, she'd remind us that the sugar used in it wasn't really accounted for in our business model. It was a good lesson in economics at a young age. Most of all, summers were just a time to dream up what to do on any given day. Spontaneous sandlot baseball games at St. Luke's playground were a popular pastime. Usually it meant no one could hit to right field, and sometimes center field because there were not enough players, but that didn't stop us. It was all fun until someone slipped on the asphalt and skinned their knee or ankle. I can remember picking little bits of gravel out of my knee more than once. 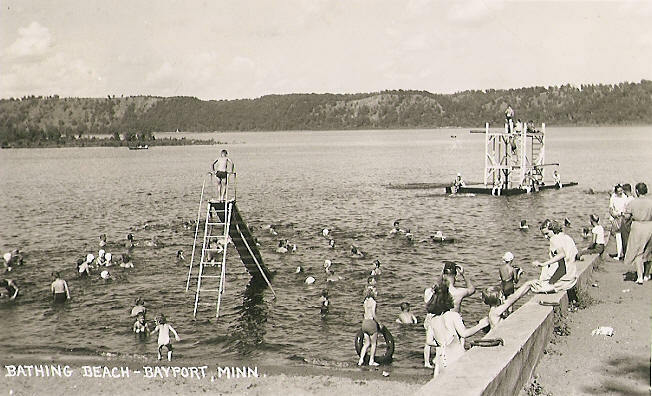 Summers were drive-in movies, swimming in the neighbors pool, basketball, "summer activities" at St. Luke's, camping and cabins, sprinkler jumping and wicked bike jump ramps. Along with it came the obligations weeding the garden, painting the garage, cutting the grass and doing the dishes. Kids today have some of the freedoms we had, but they live in a different more dangerous world. They still manage to get bored, but if they knew what the future held, they'd probably spend their time a lot more judiciously.